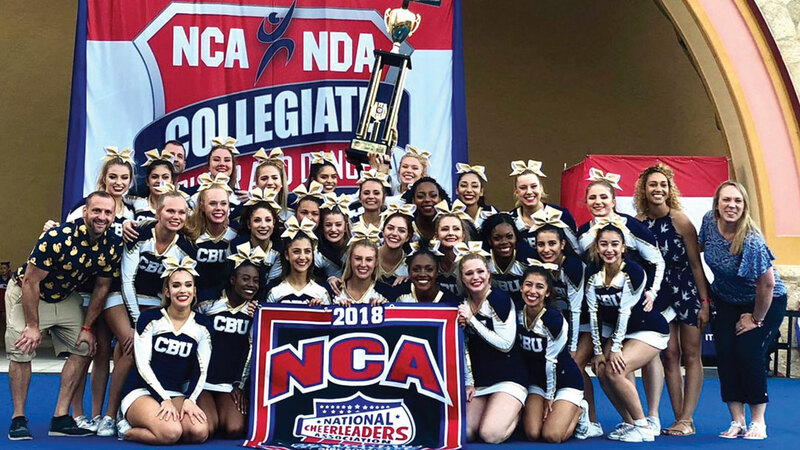 Two weeks after wrapping up the end of the season, the California Baptist University cheer team reflected on their sixth straight NCA championship, top-three rankings for their STUNT team and an unforgettable season. Two STUNT teams from CBU competed at Daytona, Florida and placed second and third in the competition. Tami Fleming, head coach of the CBU cheer team, said she was ecstatic when both teams’ accomplishments were announced. For the first time since 2012, CBU cheer went into finals in second place after making costly mistakes during their preliminary round but Fleming said she had faith in her team to execute a perfect routine. “One of the things I won’t forget was reminding the team that it is ‘like us’ to hit a routine and if they went out and threw a zero deduction routine in finals, the results wouldn’t matter because they would know they did their best,” Fleming said. The team did just that and earned a zero deduction routine in the finals. Although the cheer team performed and looked their best during the competition, the preparation is not always as pretty. “We are all pretty exhausted and sore from the long season (because) injuries and illness do happen a lot second semester,” said Jordan Arrington, senior kinesiology major and back on the cheer team. Fleming said the cheerleaders practice between 10-15 hours a week, and while they had setbacks, the team was always able to overcome any challenges they faced. Kaitlyn Statham, junior public relations major and flyer, said she enjoys getting to display her and her teammates’ talent during competitions. “The best part about competing is being able to put all of our hard work in front of a crowd and doing it alongside your friends that turned into family,” Statham said. Arrington said the STUNT teams being successful on finals day and placing second and third was her favorite moment of the season. “It is what we worked all season for and actually accomplishing it was such an amazing and emotional feeling,” Arrington said.